Established in 1773 and organized as a Monthly Meeting, 1790. Building erected 1927 on original site is 1/2 mile east. For a quarter century beginning around 1750, immigrants, many of them members of the Society of Friends, swarmed into Piedmont North Carolina. 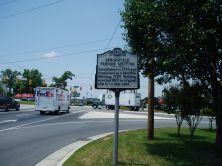 The first meetings in the colony were organized in 1751 in Alamance County at Cane Creek and in Guilford County at New Garden, since that time the historical center of Quakerism in North Carolina. Other Friends meetings soon developed, among them Springfield, the site of which is today encompassed by the city of High Point. From Springfield and other meetings in the Piedmont were launched in the early nineteenth century the westward migrations of Quakers to the present Midwest. Meetings were begun at Springfield in 1773. In 1780, at the request of the Deep River meeting under whose guidance they remained to that time, Springfield was set up as a Preparative Meeting. In 1786 church members received the deed for five acres on which their meeting house was then standing. 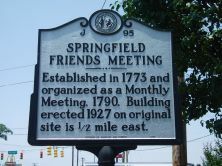 Springfield was established as a Monthly Meeting in 1790. The second meeting house, a frame structure, was built in 1805. The third building, made of brick and completed in 1858, featured partitions between the men’s and women’s sides. It is connected by a colonnade to the present 1927 meeting house. During the Reconstruction era Springfield was a center of activity for the Baltimore Association, which worked toward the early opening of thirty schools across the South. Promotion of agriculture was a keen interest of community members and the Model Farm was established nearby in 1867. The Springfield Memorial Association, organized in 1906, converted the 1858 meeting house into the present Museum of Old Domestic Arts. Springfield is the mother church of the High Point Monthly Meeting, set off in 1892, and the Archdale Monthly Meeting, set off in 1924.